When we talk about ‘enterprise’ businesses, we're talking about those well established companies that operate as a solid function across all departments within the business. Gartner defines what it means to be 'enterprise' pretty well here. For a long time now, enterprise retailers have chosen traditional warehouse systems to manage their inventory and that is often because traditional systems are designed for retail warehouses. With the progression of e-commerce, however, these solutions are fast becoming unsuitable for enterprise businesses looking to branch out into the world of online sales. The functionality of a software-as-a-service (SaaS) warehouse management system (WMS) has proved itself as a much better solution for the enterprise market. This blog post is will tell you how. In the past, companies may have had just one core ERP system but that is not the case anymore. Enterprise companies need to integrate with several applications to run efficiently: an eCommerce platform, accounting software, and marketplace management software to name just a few. The right SaaS provider will have an open Application Programming Interface (API) into which integrations can be easily written. For the enterprise market, having a WMS that allows you to self-serve easily makes the implementation far less painful. Marks of a self-service WMS would be having a knowledge base and user guides for the client to review and learn from. 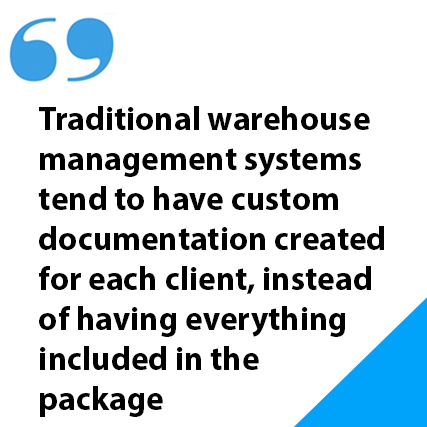 Traditional warehouse management systems tend to have custom documentation created for each client, instead of having everything included as part of the package like you would get with a SaaS system. Some of the biggest brands and enterprise businesses start out with very small e-commerce divisions. It's typical for online sales to only make up 2-3% of their revenue. This is a figure that starts small, but often explodes. Rapid scaling with higher volumes of orders should be expected. As such, what they need is a system that can start small, be implemented quickly and scale up as they grow. A SaaS WMS works very well for the both smaller and more developed e-commerce propositions. This is because it’s designed around a scalable infrastructure. Traditional warehouse software, on the other hand, often isn't suited to the needs of large companies with burgeoning e-commerce arms. It's only really fit for use with more established operations. Read this case study with Mothercare to see why they needed to replace their traditional WMS with a SaaS model, and how this change helped its e-commerce sales to flourish. If you're not a pureplay e-commerce retailer, you will realistically need your SaaS WMS to have the capability to handle your retail operations, too. This is something that the technology is particularly well-designed to accommodate. The is because it already has more functionality than a traditional WMS. 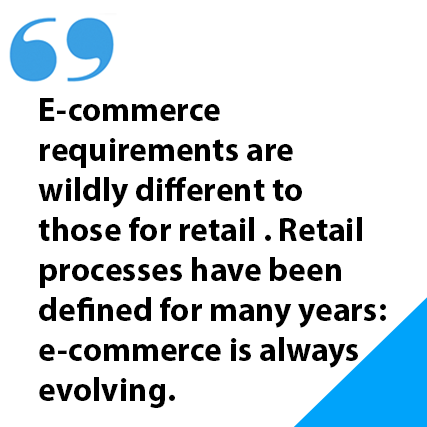 The requirements for e-commerce are wildly different to those for retail warehouses. While retail processes have been defined for many years, e-commerce is ever changing and evolving. Unlike with traditional retail demands, the variety of items and destinations that e-commerce picks head to are hugely varied. As such, warehouse management systems that have not been designed to adapt will not do so when needed. A SaaS WMS, on the other hand, has always been designed to be flexible. We go into this topic in far more detail here. To dabble in e-commerce, you have to seek a competitive advantage over everyone else in the arena. This means that innovation is hugely important, particularly as e-commerce is still evolving and its requirements are being redefined every day. As an example, sites like Groupon changed the way that processes were completed in the warehouse so that a picking method could be designed to pick several hundred of a single item. SaaS systems have one code base which means that innovation can be worked on consistently and issued out to clients quickly. For enterprise retailers entering the e-commerce race, this is crucial. With a traditional on-premise WMS, not only does a vendor need to innovate, they have to deploy to each client one-by-one which delays the roll-out. When implementing a traditional warehouse management system, you will need to have people within your business that have the technical know-how to assist with the implementation and maintenance. With a SaaS WMS, very little IT overhead is required at all. This means that your technical guys can stay focused on making your e-commerce platform look and run spectacularly. With fewer IT resources required from the vendor, too, this is also reduces the cost. Implementing a traditional WMS requires a server on site, a database expert or at least a third party provider to do database management, backups and resiliency checks. All of this is a big overhead on staff and IT. Understandably, enterprise companies want to avoid further investment, or upsetting their existing architecture, if e-commerce is not core to the business. Security, backups and resiliency are included as standard by the SaaS WMS provider. This is often to a far higher specification than the retailer could offer through their internal teams. This means that established companies can start to put steam into the e-commerce train without needing to allocate too many dedicated in-house resources. When you put a new system into your enterprise e-commerce warehouse, you want it to be as easy as possible to train people on it. With a simple user interface that most people are familiar with using, new staff can be trained on a SaaS system in as little as 30 minutes for pick, pack and despatch. Not only does this mean that you can bring in new users at peak and have them ready to work immediately, it also means that you save time and money on sending workers out on external training courses. One of the strongest aspects of a SaaS solution is that, in many cases, it is focused on one particular niche. As such, it can dominate that niche and constantly redefine and hone what it means to be operating at an enterprise level. Look at what Base has done for helping sales teams to grow, or the marketing solutions that Ometria has created for e-commerce companies as further examples. Traditional systems generally tend to be big all-rounders. They don't have a particular focus. While this may have worked in the past, if you're looking to expand your e-commerce arm, you’ll want a system that was specifically designed for that purpose so that you can fully capitalise on its strengths. Last but by no means least, if you buy a traditional warehouse system, the vendors will charge an up-front lump sum. Then there will be added costs along the way for upgrades and customisations. At first glance, the outlay may look to be lest cost-heavy. But a lot of the costs that are included with a SaaS solution are being hidden by traditional vendors. These hidden costs include (non-exhaustively), upgrades, server licenses, and database management. With a traditional WMS, expect to fork out more for each of these on top of the initial costs. 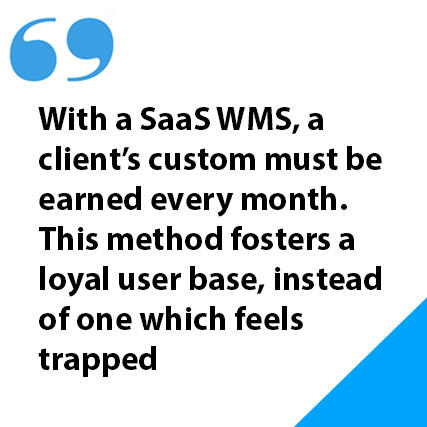 With a SaaS WMS for enterprise, a client’s custom must be earned every month. This is because they pay on a subscription basis. This kind of method fosters a loyal customer base, instead of one that feels trapped because they have already paid in full. Which type of Warehouse Management System makes the most sense for your NetSuite business?